Safety Chain Holder for Aluminium Chassis Boat Trailer Rails. High Tensile, grade 8.8 bolts required but not included. Couplemate safety chain holders are welded to an 8mm plate. Dee shackles or bow shackles are not approved for the attachment of safety chains to safety chain holders (on the trailer). Conversely, dee / Bow shackles are approved for attachment of the safety chain to the tow bar only. Regarding lengthening safety chains. Hammerlocks but not multiple dee shackles may lengthen chains. 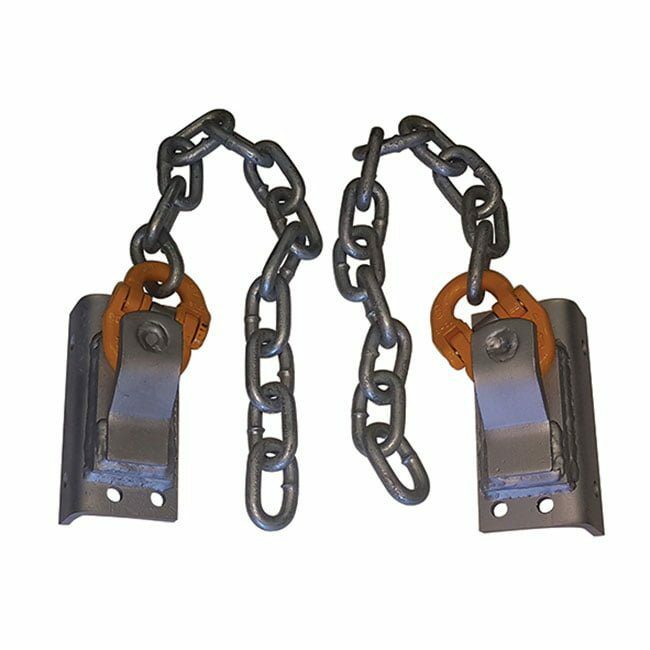 Furthermore, dee shackles do not connect to the safety chain holder is the chain must not be detached from the chassis rail, under any circumstance. It is possible to detach the chain using dee shackles. Also, once the safety chain holder has been installed and tensioned by your installer, it is installed for life or until such time the manufacturer decides the holder should be upgraded. In the past, we have seen some pretty bad chain setups. As a result, we took time out to invent a simple solution to a critical problem. You are required to weld the safety chain or safety chain holder to your chassis rail. For example, it is not possible to weld steel brackets to aluminium trailers unless some innovative engineering is provided. In the case of a welding chain directly to the trailer, the weld must cover 1/2 the link only. However, Aluminum chain is not permissible to use as safety chain. Summarising about dee shackles and safety chains. Good question Paul, we considered the strength of bolting a plate straight onto an aluminium frame. There was weak points in the modelling. Wrapping the plate under the chassis rail solved the problem with the weak point and provided more than enough strength to cater for shock loads associated with detachment. Most OEM carry their own liability of design as we do with this design. We would rather see the chassis rail buckle and snap before this bracket came adrift. We also have available the plates only, without the holder should OEM decide they have another solution. CAll our sale steam if you wish to inquire about the angled base plate. Thank you Paul.